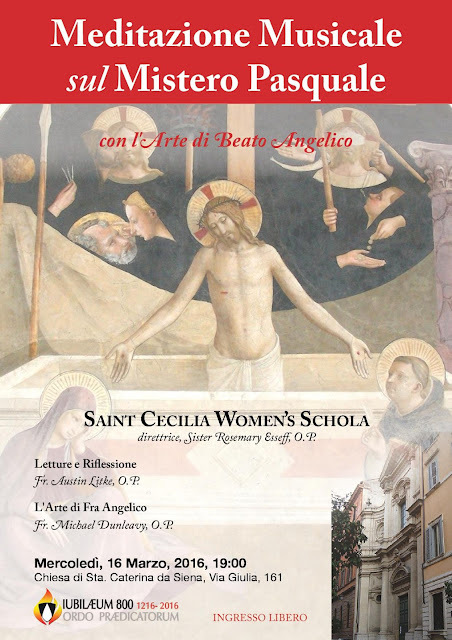 This coming Wednesday, March 16, the church of St Catherine of Siena in Rome will host a concert of both Gregorian chant and polyphonic music from the Triduum and Easter, starting at 7 pm. The concert is titled A Musical Meditation on the Paschal Mystery; during the singing, images of the works of the famous Dominican painter Blessed Fra Angelico will be shown on a large screen, selected by Fr Michael Dunleavy, O.P. There will also be Scriptural readings and brief relfections delivered in Italian by Fr Austin Litke O.P. ; all in all, a true opportunity to evangelize with sacred music, art, and the Word of God. The church is located on the via Giulia, fairly close to the Ponte Sisto.